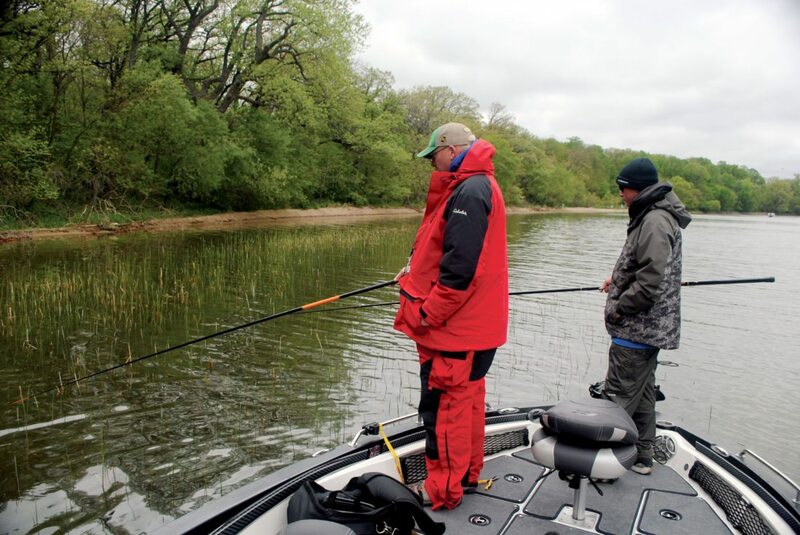 — Submitted photo A pair of anglers work some shallow water reeds in the spring. Note the long rods with no reels. The big lake near where I live still had a lot of ice on it when I drove by a few days ago, but it was opening up near the shoreline. But the smaller ponds in the area have a lot of open water. In fact, of friend of mine told me that a friend of his had just caught a nice bunch of crappies from the open water in one of those ponds. 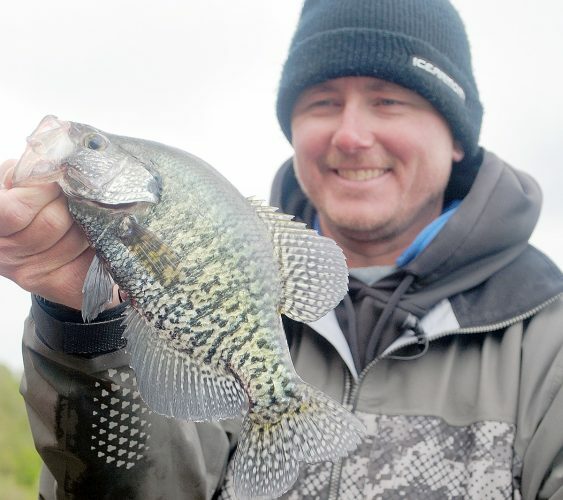 For many anglers, panfish are how we kick off another open water fishing season. Most of us have a body of water nearby that it is home to bluegills and crappies and the like, and they’re a great place for that first fishing trip of the year. Here’s how you do it. 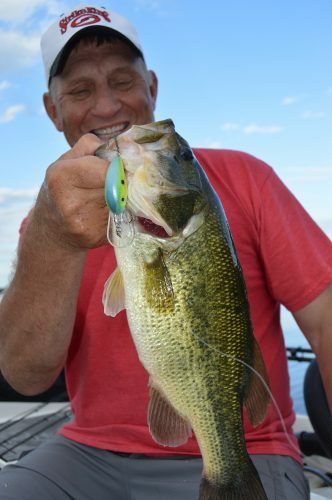 One of the keys is finding the warmest water in the lake or pond you’ll be fishing. Warm water makes the fish more active and more likely to eat your lure. The north side of a body of water warms up faster, as do the bays and canals and areas like that. Those are the areas where we’ll be concentrating our efforts. Panfish like to be near “stuff”. “Stuff” could be a tree that has fallen into the water, a dock or boat lift, anything that provides some cover for the panfish that’s in warm water and is close to deeper water will probably be the hangout for some bluegills or crappies. A small jig under a slip-bobber is probably the best presentation this time of year. If you’re after ‘gills or sunfish, go with a tiny jig. Something in the 1/32nd or 1/64th size range will be good. If crappies are the quarry, go a little larger, maybe a 1/16th ounce jig. Crappies have a large mouth and can handle a bigger jig. ‘Gills and sunfish have tiny mouths and prefer tiny meals. By using a slip-bobber, you can suspend the jig right in the fishes face. A slow presentation is best now, and the slip-bobber allows for a slow presentation. Set the bobber stop so the bait is just a tad above where you expect the fish to be. They’ll go up to take a bait, but rarely down. Black is a good jig color. In many areas the panfish are eating just hatched black bugs in the spring. Crappies seem to prefer something brighter. A Fire-fly jig tipped with a small minnow will be a winner. Or try an Impulse Helium Stonefly. These jigs are meant to be fished under a bobber and they look like the bugs that panfish like to eat. Maybe tip it with a waxworm or spike if the fish are a little hesitant to eat it. Twitch your rod gently to impart a quiver to whatever jig you use. Rig your baits on four pound test line. P-Line CX Premium has become favored among many anglers. It’s easy to manage and it fishes well around cover. Additionally, some of the most successful panfish-catchers have gone to longer rods. The traditionalists might go with a seven foot rod in medium light action. This length is good for swinging baits into position and for swinging fish into the boat. Others go with a rod with no reel, just a couple feet of line tied to the tip. Cabela’s has one called a Whuppin’ Stick that telescopes out to ten or twelve feet and is very affordable. They have become extremely popular in many areas. If you’re anxious to get fishing, find a panfish pond or lake in your area and get out there. The fish will bite if you just put a lure in front of them.